Building the first trail in the new Sapwi Trails Park on Oct 21. On Saturday during the Conejo Fall Trailwork Day, a group of 193 volunteers helped build the first trail in Sapwi Trails Park. We completed 0.67 miles, about half of the new trail. Some of it was along a very steep cross-slope so we had to move a lot of dirt to establish the tread. Much of the rest of the trail was across a gentle cross-slope, so it can be traversed even if it hasn’t been finished. You can see photos of some of the work that was done in our photo gallery, as well as pictures of the lunch and muk-a-muks who turned out to celebrate the occasion. After the trailwork is finished, CORBA will treat you to lunch afterwards. No experience is necessary to help out with trailwork. Tools and instructions on how to use them safely and effectively will be provided. Be sure to wear protective clothing (sturdy shoes, long pants and sleeves, hat, golves) and bring snacks, sunscreen and water. CORBA will provide the tools and training. We request that you pre-register online at https://www.meetup.com/CORBAmtb/events/242673091/ so that we’ll know how many tools to provide. Remember, by registering here, CORBA will treat you to lunch afterwards! 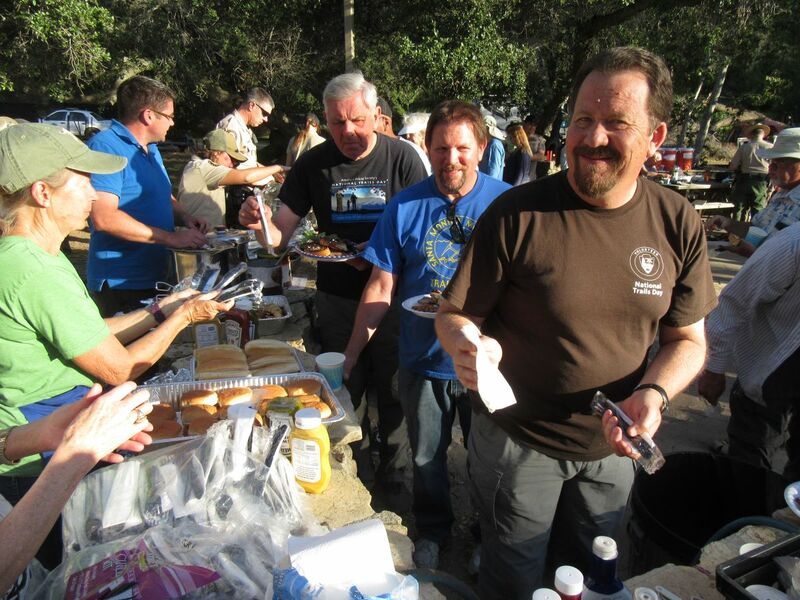 CORBA’s thank-you lunch will be after trailwork ends at 2:30 pm, so bring some snacks to tide you over. The online registration page also contains details about where and when to meet. Burt Elliott, trail maintenance coordinator, leads volunteers and fellow members of the Santa Monica Mountains Trail Council to the Saturday work site. 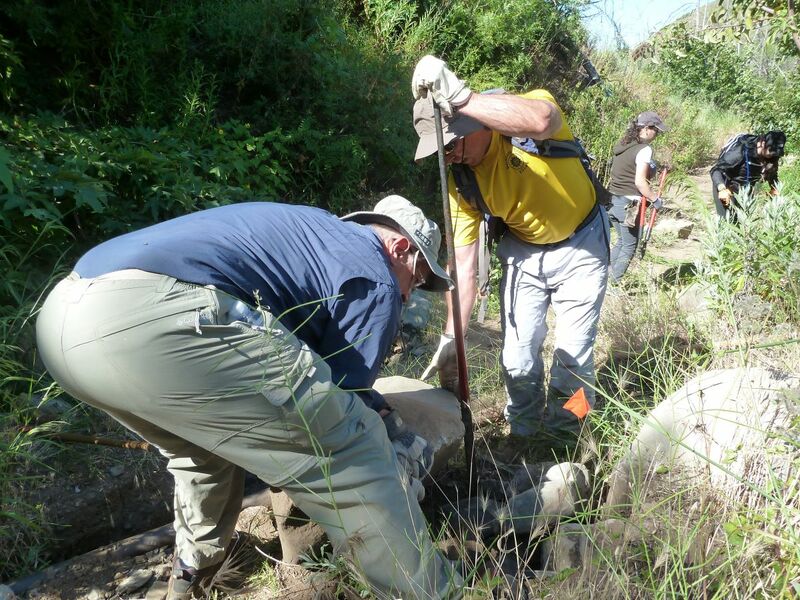 Volunteers cut back shrubs, cleared minor slides and upgraded runoff canals along a 1.4-mile stretch. Encumbered by heavy tools, a dozen members of the Santa Monica Mountains Trails Council met Saturday morning in the dirt parking lot of a trailhead on the Backbone Trail. Their mission: trail maintenance. 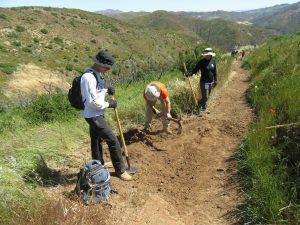 Oxnard resident Dave Edwards, group leader, said the purpose of the volunteer, nonprofit organization is establishing and maintaining the public trail system throughout the Santa Monica Mountains. That’s why he and his colleagues were shouldering pickaxes, grappling with loppers (oversized pruning shears) and swinging McLeods, the five-tooth rake with a cutting edge used by California Division of Forestry firefighters. They were heading out on a two-mile hike to combat trail ruts and erosion from rain and mountain bikes by digging water bars to drain rainwater from the trial. And they do come back — every weekend and one Wednesday a month, 10 months a year. July and August are a respite because of the heat. Edwards said they are often joined by the Santa Monica Mountains Task Force of Sierra Club or members of Concerned Off-Road Bicyclists Association (CORBA). 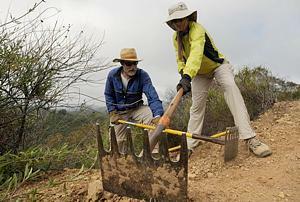 CORBA members Steve Clark of Newbury Park and Claudia Mitchell of Oxnard team up Saturday to groom Backbone Trail with the Santa Monica Mountains Trail Council. Armenta said she might bring her friends to meet her new hiking friends at the 28th Santa Monica Mountains Trail Days — 2009. The three-day event will kick off April 24 at Point Mugu State Park. It’s a weekend devoted to building new trails and restoring old ones in partnership with the Trails Council, California State Parks, CORBA, California Native Plant Society, the National Park Service, Santa Monica Mountains Natural History Association, Temescal Canyon Association, Santa Monica Mountains Task Force of Sierra Club and Conejo Sierra Club. Camping is free for trail workers. 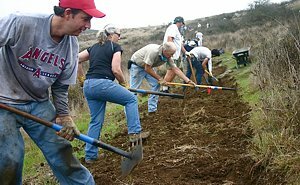 All volunteers are welcome; trail work experience is not required. Camp will be at the Danielson Ranch multiuse site under sycamore and oak trees in the heart of the park. For more information, call 818-222-4550 or visit http://www.smmtc.org. More photos are available in the VenturaCountyTrails.org photo gallery. 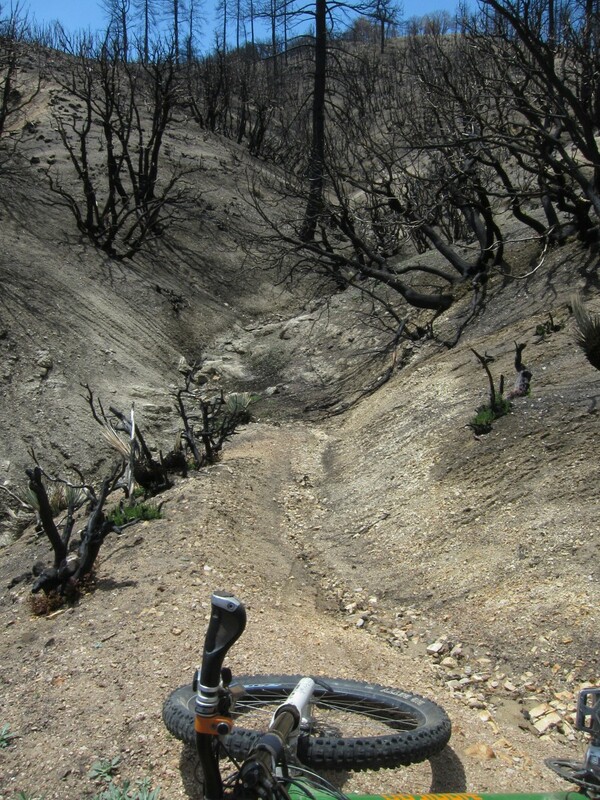 The article indicates that the trail erosion was caused by two factors: rain and mountain bikes. Identifying one user group without mentioning the array of factors that contribute to erosion does not fairly portray that group and implies that erosion is somehow use-specific, when it is not. Independent studies demonstrate that mountain bikes cause no more surface erosion than other types of trail use. And, many factors contribute to the erosion of trails, including natural and human sources. Water causes the most damage to trails, as it is the most erosive force of nature (that’s how we got the Grand Canyon). All trail recreation has some impact, however that impact is increased or decreased as a result of many factors, including trail design. Sustainable trail design and properly constructed water control features serve to minimize erosive effects of nature and trail users. The bottom line is that trails are built by people primarily for recreational use. Because trails are unprotected by vegetation and exposed to the elements, particularly concentrated rainwater erosion and continuous plant growth into the open trail space, trails must be maintained or they will erode away and be overtaken by vegetation. 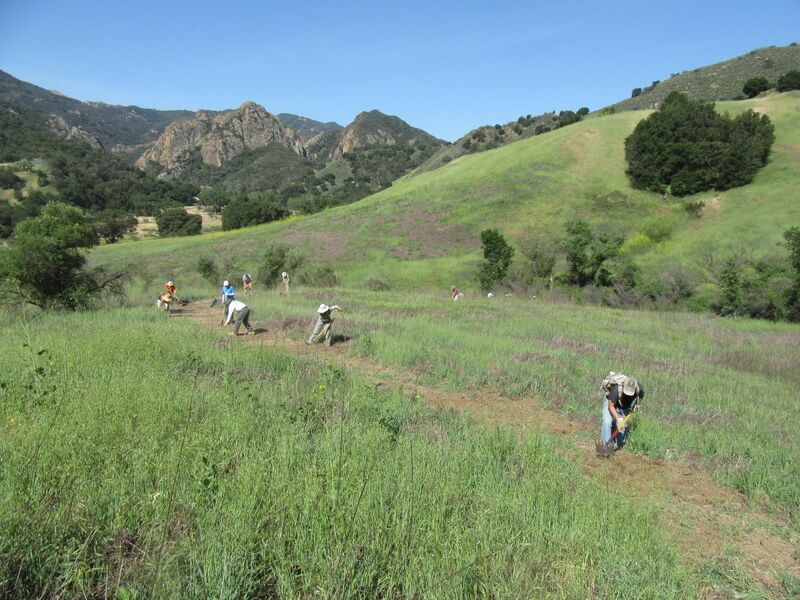 Hiking and biking groups such as the Santa Monica Mountains Trails Council and Concerned Off-Road Bicyclists Association take a leadership role and deploy volunteer teams year-round to maintain these precious resources for the community to enjoy. We welcome everyone to come out and join us. CORBA is pleased to announce the approval of our proposal for a new trail in the Angeles National Forest. The new Rock & Rail Trail will be a 1 mile long trail at the summit of Mount Hillyer near Chilao. It will include many technical features. Read all about it on our Mt Hillyer Project web page. Spring has sprung and so did the Mustard plants! The New Millennium Trail has become so overgrown with this plant the trail is unusable at this time! 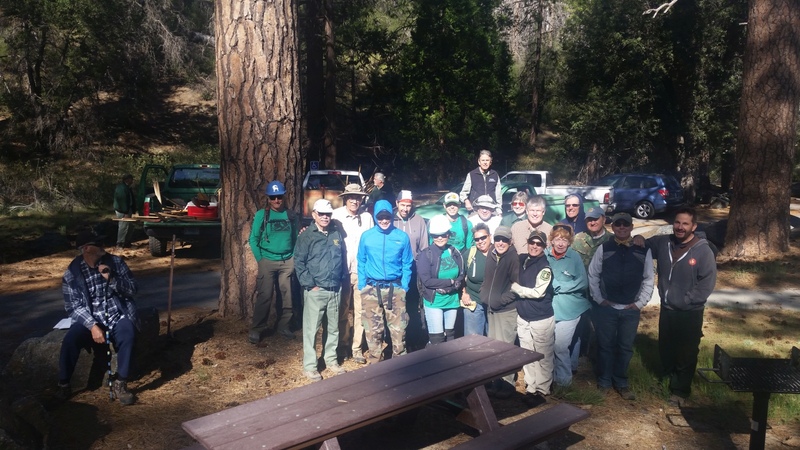 The CORBA Trail Crew was out on 4/15 and 4/17 working on the trail. It was a slow process but we managed to clear .7 of a mile from the intersection of the Bark Park Trail heading south. There is still much work to be done! CORBA has been communicating with the Mountains Restoration Trust (MRT) to come up with a solution to get this great trail passable once again! The MRT has mobilized their Crew to work on brush removal on the trail. The CORBA Trail Crew returned to the trail on 5/9 and worked on some slides and erosion problems on the South side of the trail near Normans Way. The MRT Crew has cleared the brush from Parkway Calabasas past Normans Way/Stokes Canyon to the switchbacks and Parkway Calabasas towards Calabasas Road/Gun Club Road past the water tank on the ridge above the other set of switchbacks. We hope to be able to report very soon that the entire trail is once again usable! December 7, 2008 Update: The trails are completely clear of mustard and other weeds. 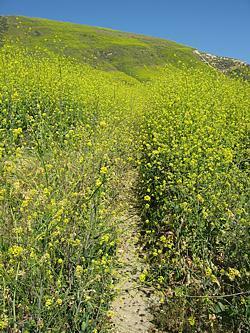 On Thursday, in preparation for the annual Santa Monica Mountains Trail Days held every year in Pt Mugu State Park, I drove my now very dusty car down the main Sycamore Canyon trail and parked at the bottom of the Wood Canyon Vista Trail, a segment of the Backbone Trail. I hiked up the trail and flagged 59 spots where drains were needed – mostly to clean out existing drains that had become clogged with silt from the winter rains, but also some new drains about 2/3 of the way up the trail. Saturday morning, the State and National park services drove 17 of us, including 2 youngsters, and our work tools to the bottom of the trail. After grabbing our tools, we hiked 1.5 miles up to the work area, about 2/3 of the way to the top, and proceeded to work down. Altogether, we put installed or cleaned 26 drains. The area of greatest concern was at the start of our work area where the trail passes through a grassy area and is solid clay. Most of the rest of the trail is very rocky. This clay section is pliable, quickly becomes depressed in the middle where a rut erodes when it rains. This section of the trail was completely restored during trailwork in February 2015, yet it was as rutted as ever after just two years. A narrow but deep rut had developed in the middle of the trail, just wide enough for a mountain bike tire to slip in and get jammed. We learned that leveling the trail doesn’t last here, so instead we cut a drain in about every 50 feet. That involved cutting through the berm (the dirt that builds up on the outside edge of the trail and keeps the water from running off), the first few inches was as hard as concrete, despite having been rain-soaked a few weeks earlier. The drains were 3 to 5 feet wide. We used the dirt we dug out of the drains to fill in the rut on the trail. Now we have a section with frequent drains to keep the water from running all the way down the trail, and the rut is filled with dirt. Hopefully this restoration will last longer than two years! Overall, we dug out 26 drains over 2100′ of trail and filled in about 500′ of rut! Well done, everyone! 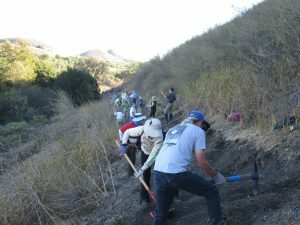 While the CORBA crew was working on the Wood Canyon Vista Trail, the other volunteers (about 60 of them) worked to restore the Upper Sycamore Trail where Sycamore Creek crosses it a number of times. By all accounts, this trail was decimated by the stream. This is a very shaded trail in a deep canyon and popular with hikers, but it’s in the Wilderness Area and so closed to mountain biking. Everyone was back to the staging area by about 2:30 so we spent the afternoon relaxing and chatting with friends until the barbecue dinner. As usual, we had chicken, hot dogs, veggie burgers, baked beans (regular and veggie), salad and garlic toast. It was up to us to bring our own beverages. As dinner was winding down, the prize give-away started. There were so many prizes that everyone must have gotten one. The work continued on Sunday morning with a much smaller force of about 30 total. We all shuttled up to Upper Sycamore Trail, then split into two crews. One hiked up to the top of the trail to work on tread issues while the other worked on clearing overgrowing brush from the bottom. Sunday is always a smaller and shorter event; we were back to the staging area by noon to enjoy left-overs from Saturday’s barbecue. CORBA would like to thank all the volunteers who came out to help fix up our trails in Pt Mugu State Park. Everyone did a great job! 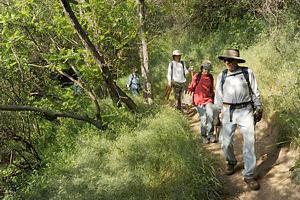 And a special thanks goes to the Santa Monica Mountains Trails Council that organizes this event every year. You can see all the photos from this weekend in CORBA’s photo gallery, or photos from Steve Messer and Xander Tenai . Take a look to see what we accomplished.